Click to view the Facebook tag/comment contest for a FREE signed copy! I’m so pumped! 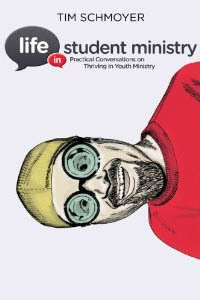 My book, Life In Student Ministry: Practical Conversations on Thriving in Youth Ministry, is now shipping! It’s so fun to see the tweets and Facebook updates of people who have received the notification that their copy of my book is on the way! In fact, for those of you who ordered a copy, take a picture of you with the book, upload it to our Facebook Page, and tell us where you’re from. It’ll be fun to see the book popping up around the country and even the world! Until Tuesday, March 1, at 11:59pm, you can win a copy of my book! Tag yourself in this photo on Facebook. Comment with a practical tip for thriving in youth ministry. I’m giving away 1 book for every 20 people who tag, thumbs-up, and comment, so your chances of winning are always the same. Or, of course, you could buy a copy. Check out a slew of endorsements from Tic Long, Greg Stier, Mark Oestreicher, Jonathan McKee, E.J. Swanson, Lars Rood, and a whole lot more on the book’s endorsement page! THE BOOK’S PROMO VIDEO: Here’s a little promo video I made for the book’s Amazon page.